Many have tried, but heretofore no one has succeeded in taking panoramic views from the side of fast-moving trains or street cars. Motion pictures are easily obtained from the front or rear of moving trains, but none with the camera lens pointing at right angles, or nearly so, to the track. 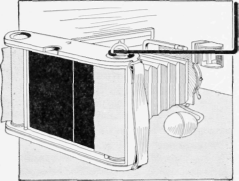 A complete apparatus for taking continuous and perfect panoramic pictures of any desired length as one travels through a country is too complicated to be described in detail within the limits of this article, but a simple arrangement, invented and constructed by the writer, will enable anyone to perform the experiment at practically no cost except for the film. Some form of a roll-film camera is essential, and simply as a working basis, it will be assumed an ordinary camera is used, post-card camera in size, for which the following things will be required: A piece of thin black card, or hard rubber; a small board, and a piece of wire to be used as a crank. The Board Used Instead of a Tripod is Placed across the Backs of Two Car Seats is 6 in. long and 3 3/4 in. wide; then cut a narrow slot, about 3/64 in. wide crosswise through the center of the material. This slot should extend to within about 1/2 in. of each edge, and the edges must be perfectly smooth and straight. If paper is used, glue it to the opening in the camera. If hard rubber is used, it can be made up as shown and set in the camera opening. This will bring the slot directly back of the lens center and at right angles to the direction in which the film moves when being rolled. A board is prepared, about 4 ft. long, 10 in. wide and 3/4 in. thick. This is to take the place of a tripod, and it must have a small hole and suitable wing nut to attach the camera near the center. This length of board will reach from the back of one seat to another when it is placed to support the camera during the exposure. A wire, about 1/8 in. in diameter, is bent, as shown, with a short hook on one end, and the other turned up at right angles, to serve as a handle. This wire, when hooked into the wing nut, will enable one to wind up the film at a fairly uniform speed. This completes all the necessary apparatus. To take pictures with this panoramic outfit, load the camera in the usual way, but do not wind it up to exposure No. 1; stop at a point where the beginning of the film will be nearly opposite the narrow slot in the black paper, or rubber. This would be to stop the turning at about the time the hand pointer appears in the small back window. Attach the camera firmly to the board and brace up the lens end so that it will not easily shake with the movement of the car. Place the board across the backs of two adjacent seats, so that the camera will point out of the window at exactly right angles to the car. When ready to expose, open the shutter wide, turn the crank that is hooked into the wing nut, and slowly wind up the film while the train is running. This will give a panoramic picture, continuous in character, and if the speed of turning is well judged, some very splendid views can be made. The speed of turning the crank will be governed by the focal length of the lens and the speed of the train. For an average lens, the crank should be given one turn per second when the car is traveling about 15 miles an hour, or the average speed of a street car. A train traveling 30 miles an hour will require two turns of the crank per second. A good method of trying this out is to use one film as a test and turn the crank a few times and note its speed by the second, then stop and begin again at another speed for a few turns and so on, until the entire film is exposed, always noting the turns and time for each change, also the speed of the train. When the film is developed the one that shows best will give the proper number of turns per second. The following points must be considered : The track should not be rough, and the camera must be perfectly steady and not twisted out of position by turning the crank, otherwise the resulting picture will be wavy. If the slot in the back board is not smooth and true, the picture will be streaked. Turning the film too fast will make the picture elongated, and too slowly, condensed. Should the camera be pointed otherwise than at right angles the picture will be distorted. 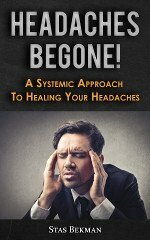 This arrangement cannot be used to take moving objects except under special conditions. A picture of a passing train of cars can be made if the camera is stationary, but the wheels and drive rods will appear twisted out of shape. It is best for the experimenter to confine himself to scenery at the beginning, avoiding architectural objects, because a variation in speed of turning the crank to wind the film naturally distorts the architecture, which variation is not so noticeable in a scenic view.